This art print features our state fish, the humuhumunukunukuapua'a (which translates to "a fish with a nose like a pig") and the Moorish Idol tropical fish. When I snorkel at Poipu Beach, these fish always catch my eye as they are so colorful and playful. 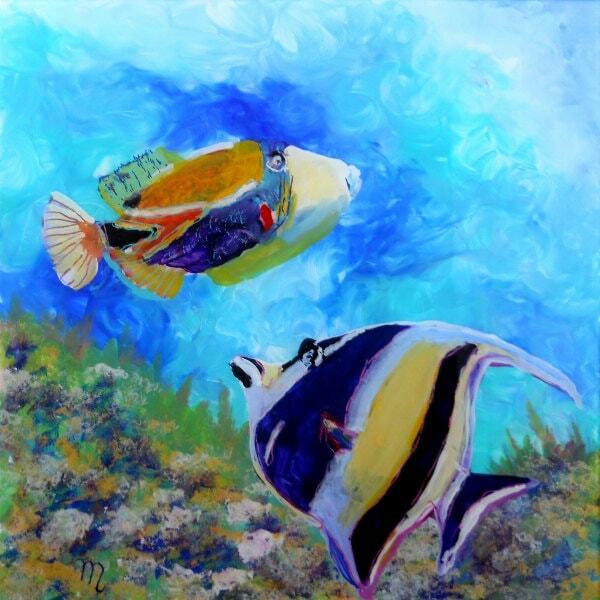 "Hawaiian Tropical Fish 2" - This giclee print is signed by the artist and is printed with archival inks on radiant white watercolor paper. It is a reproduction of an original acrylic painting and comes packed in a clear sleeve with a backing board (unframed). Colors may vary slightly from monitor to monitor.